We called our house "Anlaby" because my husband originally comes from Hull in Yorkshire, England and spent his childhood in a house just off Anlaby Road which runs from the centre of Hull to the village of Anlaby which sadly has now been swallowed up by suburbia, although it still keeps it's village characteristics. 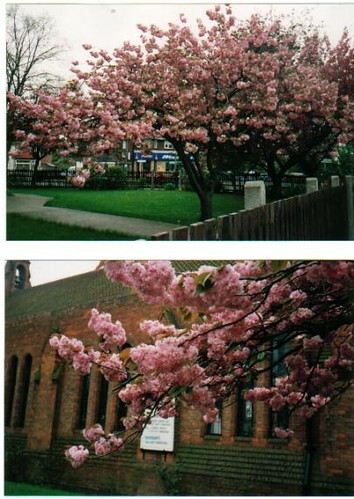 Anlaby Road has these gorgeous pink flowering Cherry trees growing on both sides of the road and down the middle of the duel carriageway. In the Spring they are a mass of blossoms but no leaves and would lend themselves perfectly to crazy quilted seams as sprays or to the centre of patches as pink trees with almost black trunks and stems but not a smidgeon of green leaves. Antique Glass German Beaded Fringing. Centre of my crazy quilted Ningaloo Reef picture.